Entering the cinemas to watch 'Due Date', I was both excited and a little cautious. 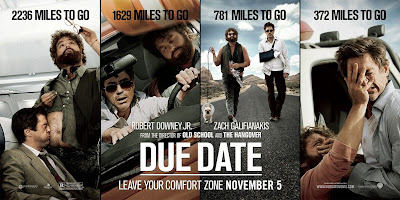 Excited because from the second I heard that Robert Downey Jr. and Zach Galifianakis were teaming up for a comedy road-trip movie with the director of the 'The Hangover' at the helm I thought "This is gonna be good!" However, early critical reviews have been, well, critical, the Rotten Tomatoes average stating that is was only intermittently funny and not as good as its Stars and Director suggested it would be. So let's say I was prepared for disappointment. After having now walked out of the cinemas with a big smile on my face, I can say that I am largely in disagreement, and if you enjoyed movies such as 'The Hangover' or any Steve Carell, Will Ferell esc. movie of the last few years, you won't be disappointed. In fact you should come out saying that it is a lot better than most of the movies that 'Due Date' is competing with. It's right up there alongside 'Hot Tub Time Machine' as best comedy of 2010. Don't get me wrong, this movie is no 'The Hangover'. Last years barn-storming hit was a rip-roaring riot of a movie, with a bunch of upcoming comedy actors,(Ed Helms and 'Due Date's' Zach Galifianakis being the main people who shone)that never let up the pace of humor and action something that 'Due Date' cannot compete with. But it's a different movie, it's a road movie, and it has a different type of comedic actor in Robert Downey Jr. He's more sardonic, dark, and dry, and boy, is 'Due Date' dark at times. Downey Jr's Peter is not your classic comedy hero. For the entire movie he's full of anger, and some serious problems that include punching a kid in the stomach and nearly throttling his co-star (Galifianakis' Ethan). Times like this treaded the dangerous line that a comedy character should go too, and I began to wonder whether his wife (played by Michelle Monaghan) would want this man near her child if she could see him. But as always RDJ is a man of so many talents that he always manages to rein you back onto Peter's side, and stick with a character who at times you feel you shouldn't. A couple of scenes in the bathroom of a roadside and then under a roadside shelter as the rain falls, about 40 minutes into the movie is one of the best bits, and it didn't have a single laugh, it just drew you into both Peter and Ethan's characters and let feel that these guys are good enough at heart to go along with, where ever they go. And importantly, this movie is still very, very funny. Scenes revolving round escaping from the Mexican Border, an encounter in a 'Waffle House' and most of the car scenes between Peter and Ethan had the audience in stitches. However, some scenes worked less well. Cameos from Juliet Lewis and Jamie Foxx got in the way and slowed the pace, jilting the Downey Jr. and Galifianakis relationship and the movie felt in a lull at these points. But all in all, as Peter and Ethan's journey reached the obvious conclusion, I was cheering them on all the way, and therefore I can strongly recommend you give 'Due Date' a whirl, and I recommend it at the movies where you can get in with the atmosphere of the big audience.